Crunchy cornmeal makes a fabulously contrasting coating to juicy vine tomatoes. To make the sauce, soak the chipotle chilli in the hot coffee for 30 minutes until softened. Place the chilli, coffee and all the other sauce ingredients except the bay leaf into a blender and blitz until smooth. Pour the mixture into a small pan, add the bay leaf and place over a high heat until boiling, then simmer for 5 minutes until reduced and slightly thickened. Remove from the heat and set aside to cool. Remove the bay leaf before serving. Cut the tomatoes into 1cm-thick slices and place on kitchen paper to dry a little. Mix the cornmeal or polenta in a shallow bowl with the dried rosemary, garlic granules and seasoning. Crack the eggs into a shallow bowl and lightly beat. Tip the flour into a third bowl. Dip the tomato slices in the flour, then the egg, then the cornmeal or polenta to coat. Heat the oil in a large frying pan and fry the tomatoes in batches for 2 minutes each side, until crisp and golden. 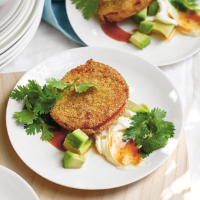 Serve immediately with the chipotle sauce, avocado, soured cream and coriander. This recipe was first published in Wed May 20 12:02:24 BST 2015.